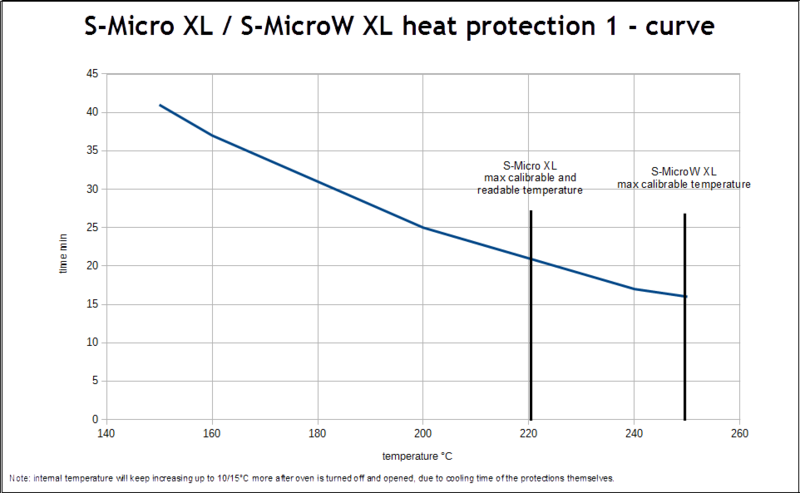 S-Micro XL/S-MicroW XL heat protection 1, up to 250°C for a maximum of 17 minutes. Heat protection for S-Micro XL logger, resistant up to 300°C, protects up to 250°C for a maximum of 17 minutes. This heat protection can be used in combination with S-Micro XL / S-MicroW XL heat protection 2. It is possible to ask for extra calibration points up to 220°C, max calibrable and readable temperature, for the S-Micro XL data loggers, and up to 250 for S-MicroW XL (the probe only can reach such temperature, the data logger maximum operative temperature will always be 140°C).